Usually when I say that, I’m referring to noted author of Westerns, Louis L’Amour, and chiding him for his contribution to the film Hondo, but this time… no. This time I speak of love. Oh glorious love! Oh swooning romance! Oh tremulous booty! I can see your uvula. Yes, we love love here at Stand By For Mind Control, but we don’t write about romance films all that often. This is because normally romances are completely inane. See, in most romance films, love is a magically perfect substance that saves the world. That’s clearly a bunch of hooey. Love can do many powerful things — turn your veins into golden opium, wrench ghastly poetry from your flapping mouthparts, embarrass you with face hickeys — but it has little to do with perfection. It shouldn’t. Love is about accepting another complicated, widely variable human being — and none of those jokers is perfect, not even my perfect wife. In most romance movies, love is something you strive for and then win so you can lock it into place like a deadbolt. I’m not even sure what to say about that message except that it’s wrongheaded and dangerous. Love, my friends, it is a glorious, challenging, never-ending journey. And the kinds of romance films I like are the ones that explore the middle leg of that journey. Not the beginning, which is all sappy and nutsy-cuckoo, and certainly not the end, which is dreadful and fattening. I like those romance films that pull apart love to find its twitching center. I like those romances that help us recognize love, even when it’s eclipsed. So, please, join us for this week’s Mind Control Double Feature so that we can all show love some love. Together, we will hold our most intimate bits to the grindstone, so to speak. I last watched George Cukor’s The Philadelphia Story twenty years ago and pretty much all I remembered was the amazing cast — Katharine Hepburn, Jimmy Stewart, Cary Grant — and that it was an exceptionally adroit romance. So I just watched it again. The Philadelphia Story may feel light, but it’s got real depth. In it, a trio of men orbit around the attractive force of Katharine Hepburn’s Tracy Lord (no relation), an upper crust divorcée queuing up for marriage number two. You’ve got her new fiancé — a political type named George Kitteridge (John Howard, no relation); her ex-husband C.K. 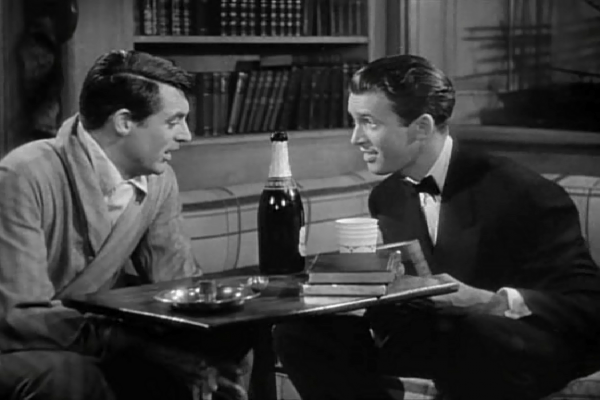 Dexter Haven (Cary Grant); and a reluctant gossip magazine journalist, Macaulay Connor (Jimmy Stewart). What draws these men to the compelling side of Tracy Lord? Well, it’s Hepburn, duh, but also it’s what Hepburn has come to represent: fire, scorn, and a sharp wit all occluding a delicately tender core. She is mighty without being distant; she is strong and soft, which is strong indeed. In the story — based on the successful play Philip Barry wrote expressly for Hepburn — Tracy and C.K. divorce acrimoniously after he fails to curb his imperfections. Two years later, in the shadow of Tracy’s upcoming remarriage, a media mogul coerces C.K. into sneaking Macaulay and his photographer sweetheart Liz (Ruth Hussey) into Tracy’s wedding. So into this house of women — Hepburn being backed by her half-jilted mother Margaret (Mary Nash) and her precocious little sister Dinah (Virginia Weidler) — men gather to fence over love, respectability, fallibility and champagne. Tracy Lord starts out pulling the strings but ends up in knots. This is the core of the film and — although it’s a bit stagey and dressed up in highfalutin frocks — it’s the part you ought to recognize yourself in. Tracy has a serious problem. She is unforgiving and yet she wants to be in love. These two qualities are incompatible. People aren’t perfect and love isn’t perfect. Perfect love is something movies made up to make it easier to sell cosmetic surgery to impressionable teens. Love is and should be as wonky as you are. That’s what makes it precious. The challenge isn’t finding a perfect love; it’s recognizing love when it crawls in your ear and nests in your organs. It won’t look perfect. It may not even feel perfect, even at the glorious beginning. It will just be right. Trying to describe that rightness to another person is like trying to carve your lover’s name into the surface of a still lake. 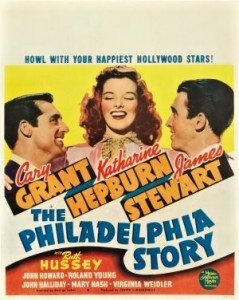 In The Philadelphia Story, watching Hepburn stumble past love, trying to recognize it despite its flaws and imperfections, is charming and wry and yar. Silly movie stars! Don’t you know that it’s the flaws that transform affection and adoration into love in the first place? 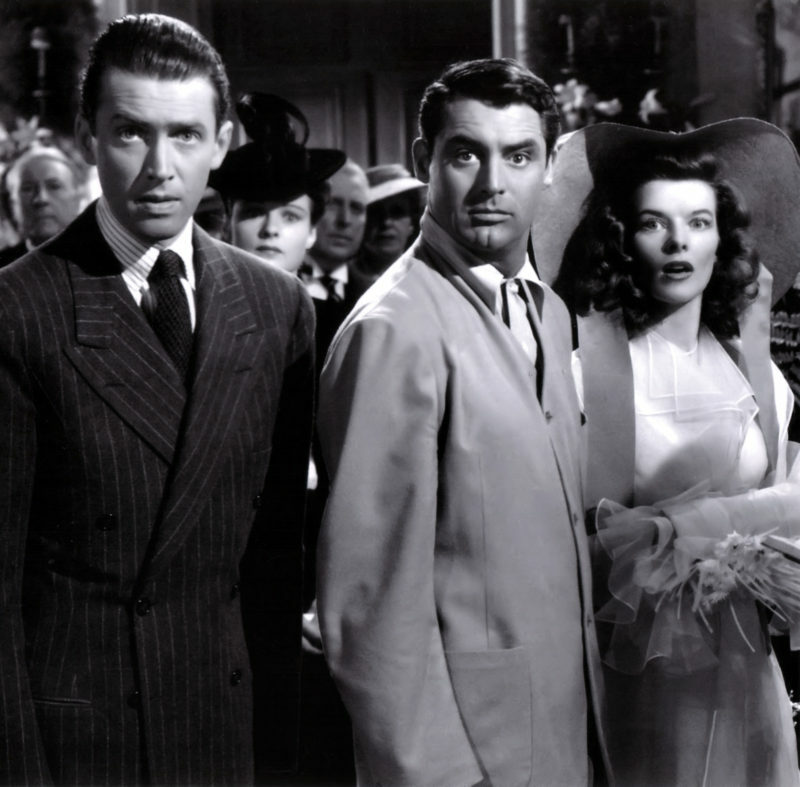 Watch The Philadelphia Story and let its sneaky lessons about true romance sink in through Jimmy Stewart’s sincerity, Cary Grant’s subdued civility, and Katharine Hepburn’s expanding engagement (pun unintended but not bad for a pun). If you can manage to drink a bottle of champagne while you watch the movie, that would also be swell. Champagne isn’t exactly like love, but both substances make your stomach fluttery and you have to start somewhere. The Philadelphia Story reignited Hepburn’s career. Believe it or not she was considered box office poison after the failure of Bringing Up Baby (now considered one of the best comedies of all time) and other great films that did poorly. Howard Hughes bought the rights to this play and gave them to Katharine as a gift. Nice gift, that, but not as nice a gift as this film is to budding romantics. Watch and learn, kids. And hopefully before your second marriage. 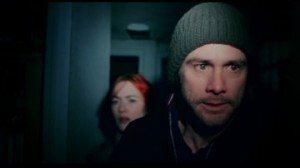 I first saw Eternal Sunshine of the Spotless Mind almost ten years ago and thought at the time that I might have just witnessed the most perfect ending ever. Now — having just re-watched it — I feel no differently. What Eternal Sunshine has to say about romance is as devoid of subterfuge as an infant’s expression. 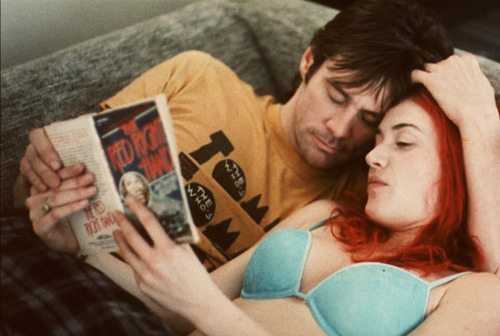 In the film, Joel (Jim Carrey) and Clementine (Kate Winslet) unreel their relationship from finish to start. This unraveling process — written by Charlie Kaufman and directed by Michel Gondry — is magical, or science-fictional, or both. Either way it revolves around a dwarf star of simple truth so dense that many live their whole lives without recognizing it. The film’s premise is impish: a company will, for a price, eradicate the memory of someone from your brain. When Clem and Joel break up, Clem pays to have her mind wiped of her ex-lover. From her perspective that means that their relationship never existed. Joel, despondent, signs up for the treatment himself. As the memory of Clem is being leached from his skull he realizes the idiocy of what he is doing. Too late, too bad, so sad! Like The Philadelphia Story, this film starts with a bust up. Then it sticks its fingers into what went wrong as it struggles to keep love alive. As Woody Allen notes, love, like a shark, must keep moving to stay alive — otherwise what you’ve got is a dead shark. And nobody wants to marry a dead shark. Or almost nobody. 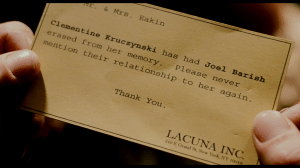 In Eternal Sunshine of the Spotless Mind, we bounce back and forth in time, in and out of memory, as Joel struggles to retain whatever potent magic he shared with Clementine. He tries to hold onto the moments of bliss and the flares of irritation because they’re both part of the same package. Normally I’m not a Jim Carrey fan, but he ditches his normal hyperactive persona to offer up an engaging performance here. 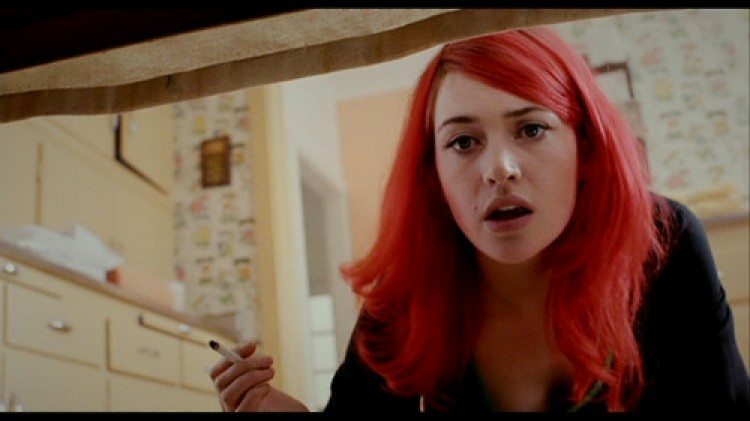 Winslet is good enough to make you forget Titanic and it doesn’t hurt that she’s completely adorable with crazy dyed hair that makes my knees weak. They’re backed by a great supporting cast — Tom Wilkinson, Elijah Wood, Mark Ruffalo, and (but) Kirsten Dunst — playing the physicians and technicians who damage Joel’s brain at his own dumb request. As an experience, Eternal Sunshine immerses you in Gondry’s kooky dream world so that you can feel the eradication of memory as violation. Visually this is a real treat, such as when Joel’s memories blend space and time together in authentically dreamlike scenes, or when he invokes the waning memory of Clem to drag her to hiding places deep inside his consciousness. Gondry is brilliant at this stuff, if perhaps overly whimsical on occasion. See me. Touch me. Feel me. The surface level story is only a candy coating, though. Charlie Kaufman’s script drags us deep down into the tempestuous vortex of relationships. I think it’s his best work; while Being John Malkovich is unparalleled in its creativity, that film’s insights into the malleability of identity do not touch this work’s revelatory vivisection of romance. That’s the person you love. Memory, identity, the intertwining of awareness: these things are the substance of real romance, not long walks on the beach or a dozen red roses served up in a tureen of cavorting puppies. 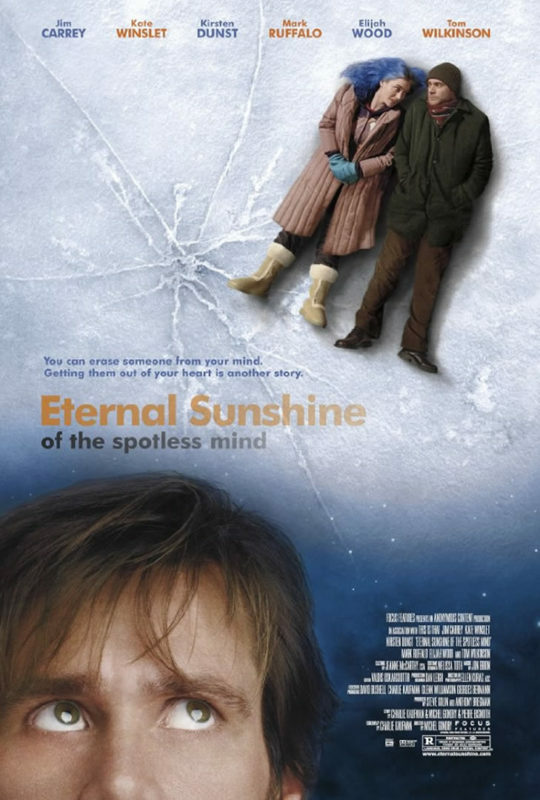 Like The Philadelphia Story, Eternal Sunshine of the Spotless Mind is about accepting the jagged edges in those we love as essential ingredients. After Joel and Clem manage to passionately reunite, they receive audio tapes that delineate exactly how fed up they were with each other in the first place. Deep in the flush of first romance (for the second time), they find their past displeasure with each other unbelievable. Clem: But you will! But you will. You know, you will think of things. And I’ll get bored with you and feel trapped because that’s what happens with me. It is a wretched impasse for all we’ve seen and observed of the pair loving and misunderstanding each other. So Joel says the smartest thing I’ve ever heard a person in a movie say. He says, “Okay,” his face consumed with emotion, with understanding, and with commitment. He finally grasps what this thing love is and he wants in. He wants Clem; the totality of her. Yes. I will find things I don’t like about you. And you will find things that you don’t like about me and feel trapped. We will fight and have bad days and be frustrated. To that I say “Okay.” I will hold tight to that true romance. As will Clementine. Nothing else could be more sane or insane. Nothing else could be lovelier. * Joel: Sand is overrated. It’s just tiny, little rocks. I watched this for the first time not long after the end of my first proper relationship. It had a profound emotional effect on me at the time and it’s become a something that I compare a lot films and art in general to in regards to that emotional truths it contains. It felt like a real punch in the gut the first time I saw it and it was an incredibly cathartic experience. It was the right film at the right moment it really made me grow up in a way. It’s a transcendent piece of film making and storytelling. It’s weird, kooky, raw, honest but all in perfect balance. I’m assuming you mean Eternal Sunshine not Philadelphia Story… and yes, I agree. It’s got that element of universal truth in it that makes art art. If you can watch that ending and not tear up and nod your head and let some knot inside you unravel, well then, you’re still a kid aincha?